Bright and fresh, this salsa is the best you’ve ever tasted! It takes just 5 minutes to make, and it’s sure to “wow” anyone you make it for! 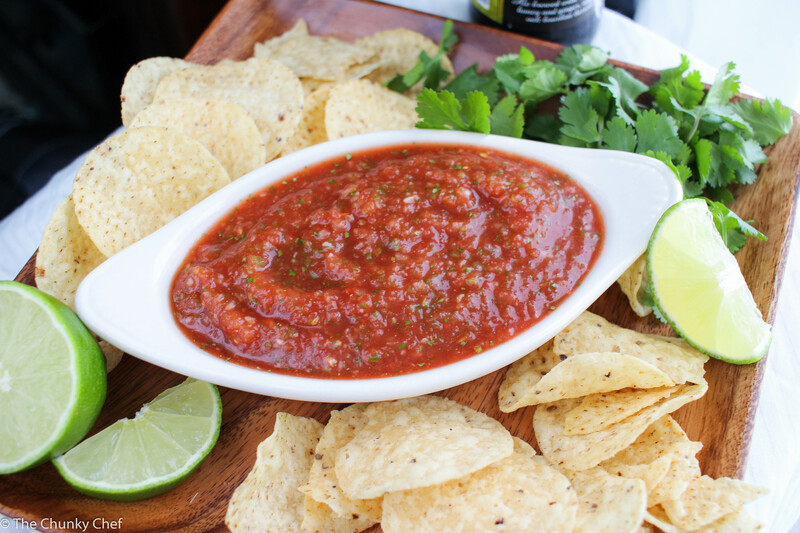 Who else loves chips and salsa? I figured as much… it’s such a classic snack! 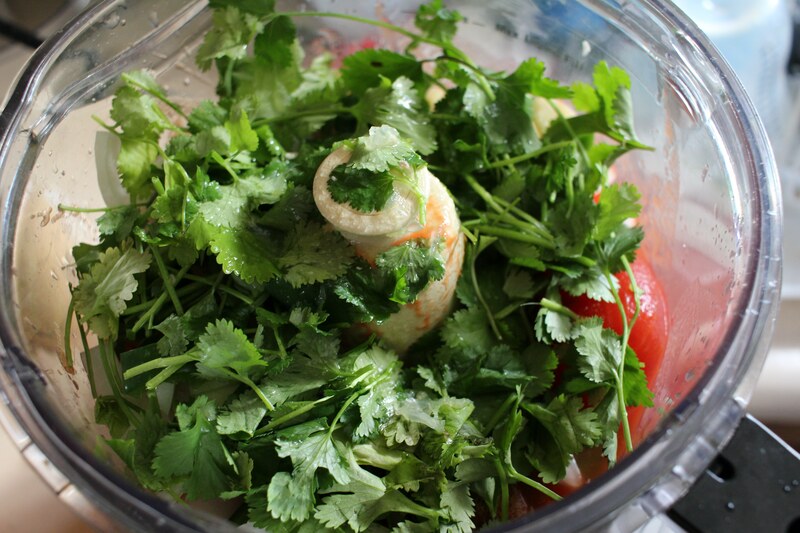 I love salsa when it’s fresh and smooth, with small pieces of tomato, onion, jalapeno, with cilantro and lime juice. Bright and fresh with a kick, as the best salsa’s are! This salsa isn’t exactly a copycat of Chili’s version… it’s a little thicker and has more cilantro taste to it… but want to know a secret? I think I like it better! I know, blasphemy! Okay back to the salsa! Just gather your ingrediets, of course you don’t need to take a picture of them like I did lol. Roughly chop your onion, and jalapeno. Add the whole can of tomatoes, including juice, your chopped veggies, roughly chopped garlic, cumin, salt, sugar, a handful or more of cilantro, and juice some limes into your food processor. 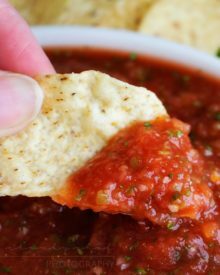 To let this salsa have the best flavor, put it in an airtight container and in the refrigerator for a couple of hours. This lets the flavors really combine and get good and acquainted 🙂 And as a bonus, I like the taste of cold salsa, so that makes it even better. You know you want that chip I’m holding there… just imagine all those bright, salty, savory, fresh flavors. Mmmmm!!! So seriously, make this. It’s the best salsa you’ll ever taste! CUISINART FOOD PROCESSOR – I use this food processor for everything, including making this recipe year round! Add all ingredients to food processor in the order listed. Pulse a few times to break up the large pieces, then process until texture is as smooth as desired. Taste the salsa and based on personal preference, adjust as necessary. Transfer to airtight container and let sit in the refrigerator for a couple of hours or 1 day for best flavor. ** I remove the seeds from my jalapeno peppers to reduce the heat level. This way you'll get all the fresh jalapeno flavor and some heat, but not a crazy amount of heat. ** I also add the teaspoon of sugar to balance out the acidity of the tomatoes and I think it heightens the other flavors. ** If you'd like, you could stir in some corn kernels, black beans, or chopped tomatoes. ** Recipe makes approximately 4 cups. You’re welcome! I would 1.5x all the ingredients, so it all has the same tastes and consistency. This is delish! I used one pepper even tho I like spicy and it only took one lime for the 3 TB. A tad bit more salt and oh my. Thanks!!! I’m currently sitting at my desk at work eating this salsa. It’s so delicious. I’ve tried with canned tomatoes and boiled fresh roma tomatoes. I love it either way. About how much is two handfuls of cilantro, in measuring cup size? Love this! Just made it. Super easy and tastes just like the Mexican restaurants! I omitted the garlic, because I’m allergic. Super happy to have a yummy salsa I can eat! We love this salsa recipe. I’ve tried several over the years and just couldn’t get it exactly right. Great Job! Just delicious. And so easy. 2 chips worth and I’m addicted. This stuff won’t last more than a day in my kitchen! Thank you for posting this recipe..
18 calories per serving… and this serves 12. So 18 calories per 1/3 cup. i just made this for the first time, well it was the first time ever making salsa, anyway its green like dark green. it tastes wonderful but its just really green. i think i might have put to much cilantro. If you use fresh tomato with this recipe would you blanch and peal them first or just use them whole? This recipe is fantastic as is, or makes a great base for peach or pineapple salsa. (3 peeled fresh peaches or 1 pineapple). 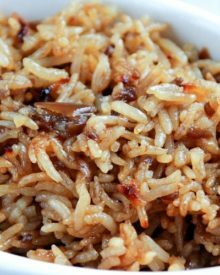 It’s fast, easy, and very flavorful! I love this salsa! Is it possble to can this salsa? I never have, but I believe some readers have canned this successfully. Absolutely incredible! Just made it with some small adjustments: added a few little skinny cucumbers, Heinz tomato ketchup and Sriracha sauce and lots of fresh tomatoes. WHat a wonderful flavor this salsa has! We’re going to have IT with Doritos right this minute…..instead of our evening meal. This salsa gets better and better the longer it sits in the fridge. Im making a second batch tonight but using Serrano’s to get the heat up. Absolutely! Substituting the canned tomatoes for 8-12 Roma or garden tomatoes should work just fine. Hi how long can you freeze the salsa for? This is my go to recipe for salsa! I love it! It’s everything you said it was, fast, easy, healthy, delicious and just like restaurant salsa only homemade. Exactly what I’ve been looking for! Can’t wait to give this a try today. Thank you! Exactly what I was looking for! This is perfect. No changes! Thank you! This Salsa looks very delicious. Definitely need to try out this one! Mine did not come out red, it came out brown? The tomatoes used can alter the color, plus I take my photos very close to a window, which can make the colors pretty vibrant. Cilantro can do that – make it muddy in color. Next time add the cilantro at the very end of blending. This is really good salsa. I have made it 4 times in the past 1.5 months. Will not make anything but this recipe. So good! Went straight to the “Go To Board”! How long does the salsa last? Hi – is this recipe good for canning? If so, are there any modifications needed? Hi Michele 🙂 I’ve never tried to can it, so I can’t say for certain… but maybe some of the other readers have left comments about doing so? Yes I used it for canning last year but I used fresh Roma tomatoes and still turned out good. TY! TY! TY! I was so happy to run across this recipie. 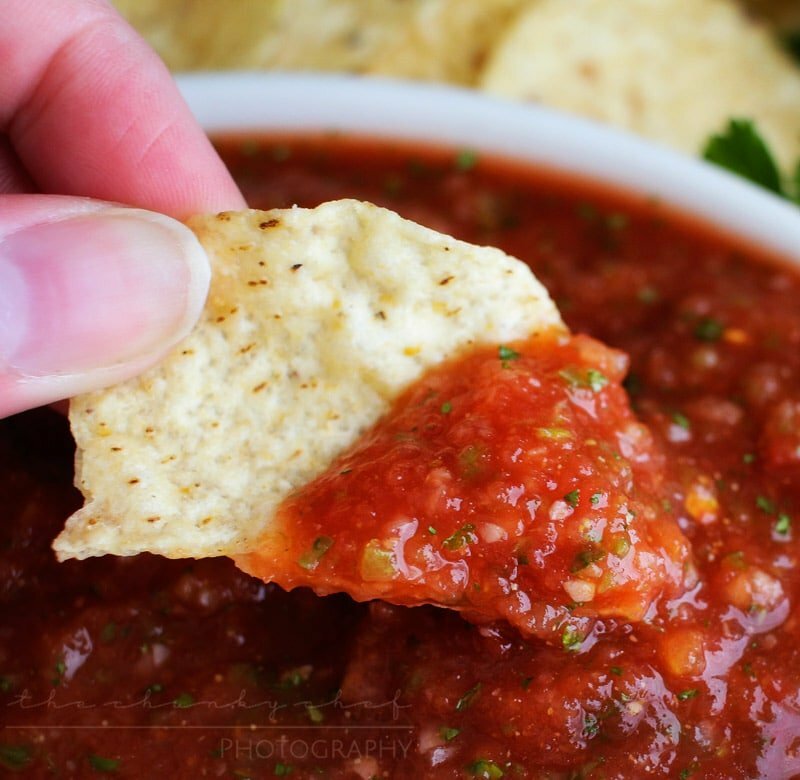 We have a lady in our building who always brings salsa that looks just like this but REFUSES to give her recipie! I made this and was so joyous that it was exact taste to hers that I took a batch to work…with recipie cards! LOL. I will also be taking a double batch to our family reunion this weekend! I love this salsa. It gets better the next day. Thank you! Great recipe! I have to modify it because I’m allergic to cilantro, and I change up the peppers depending on how spicy I want it to be. I’ve made this recipe for my work’s salsa competition twice now and everyone loves it. 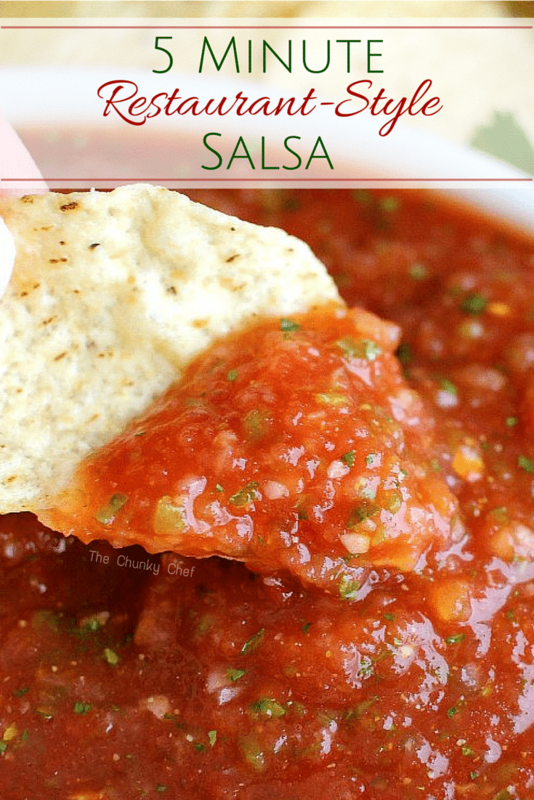 This looks delish, I LOVE a good salsa! How long will this last in a refrigeratoor? I would say about 7-10 days, if kept sealed. 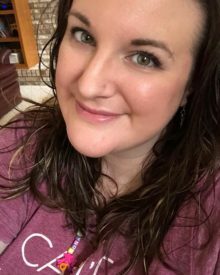 Hi Amanda – thanks for sharing this awesome recipe. It is now my go to salsa and all my friends love it! I make it the night before to let the flavours develop and it keeps for days. This salsa is amazing! Just the right amount of spice! This has definitely become my go to for parties! Thank you so much! I would say about 7 days. I have made this recipe several times. It is so easy and taste so fresh! The longer it sits the better it tastes! Can you can this salsa? Hi Tammy 🙂 I never have before, so I can’t say for certain. Might be a stupid question, but how many fresh tomatoes would I use instead of canned? Hi Tannya 🙂 Not a stupid question at all! I would say 10-12 medium sized plum or Roma tomatoes would be a good substitution. Awesome recipe. I put in a little too much lime juice but that’s what happens when younsqueeze directly without measuring! Took 45 minutes in total to make including driving to the grocers to buy ingredients! How long does this salsa stay good for if it’s not canned? If it’s fresh and covered in the refrigerator? Hi Michelle 🙂 Ours usually gets eaten fairly quickly, but I would say it would last a week or so in the refrigerator. Wow!! This recipe is pure perfection!! 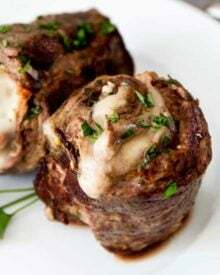 Thank you so much for sharing this wonderful recipe, so glad I ran across this. Everything is so balanced flavor wise. To me, this is better than a restaurant salsa!! My go-to recipe for sure!! AMAZING SALSA! My whole family fell in love with it! It was finished in about 2 days it was so good! Make it for taco night every night now. Nom Nom!!!!! This is by far the best salsa recipe. I substituted 1 TBSP Sriracha sauce for the jalapenos. Delish!! This is not as good as restaurant salsa. It’s BETTER than restaurant salsa. This is so good I could eat it with a spoon. Like gaspacho! How do you substitute fresh tomatoes into this recipe? Hi Liz 🙂 I’ve never tested it, but I think substituting the canned tomatoes for 8-12 Roma or garden tomatoes should work just fine. what do I do if I don’t have a food processor? I made this today without the salt due to a low sodium diet restriction. I think it tastes good without it, really fresh. I’m letting it set for another day in refrigerator before indulging. Thanks for the recipe! Is this recipe one that can be canned? Hi Tabitha 🙂 I’ve never canned it, and don’t know enough about canning uncooked foods to give you a definite answer. I do know that the salsa freezes well though. How long does this stay good? Also, can you freeze it? I LOVE SALSA BUT NOT CILANTRO. WILL ELIMINATING IT FROM THIS RECIPE MATTER MUCH? I EAT SALSA ON SCOOPS WITH A DAB OF SOUR CREAM. 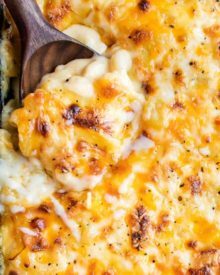 YOU CAN ALSO PUT SHREDDED CHEESE INTO THE SCOOPS, MICROWAVE A FEW SECONDS TIL CHEESE MELTS, TOP WITH SALSA AND SOUR CREAM. YUMMY! YUMMY! This recipe looks great! Can I replace the fresh jalapenos for pickled jalapenos? Those are what I usually have on hand. Thank you for the recipe! Allowing tomato-based recipes like this to get cold and quiescently congeal is important. My very first batch is sitting in the refrigerator right now. It is a bit runny, but I’m not draining off those flavor-infused juices. No need to. When this salsa, (or any tomato product) sits, undisturbed, it gels or congeals. It will absorba lot of runny liquid and thicken the salsa… In fact, it is what makes ketchup thick when it is cold and sits in the refrigerator. Hi Anna 🙂 Oh I’m so glad you loved the salsa! Hi Nan 🙂 I just grab a handful and twist to pull them off. If there are any large/long stems, I remove them, but other than that, I just put the whole handful into the food processor/blender. Found this on Pinterest! It was super yummy and easy, just like you said. Thank you very much for sharing this recipe. Hi Kristine 🙂 Our usually doesn’t last long before we eat it lol, but I’ve made it a week in advance and it was still good. Hi Darla 🙂 It’s a recipe inspired from another blog, and I’m sorry to say, I don’t know of it’s descent or origin. How would you adapting this for using fresh tomatoes? 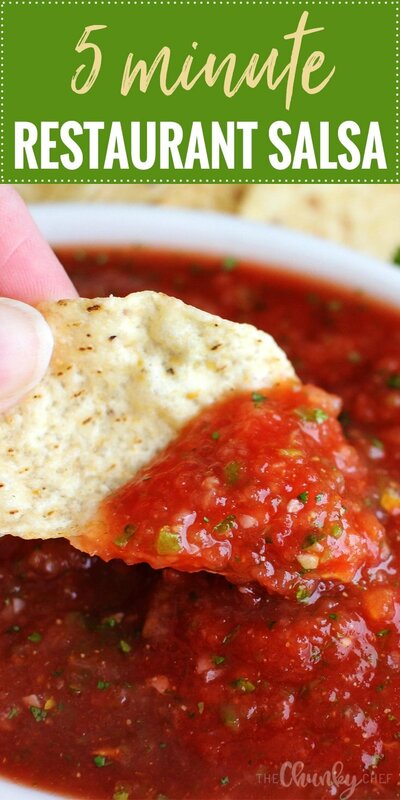 This salsa is just perfect! It is the easiest and tastiest I’ve ever made. Thanks for the recipe! Funny you mentioned Chili’s salsa as Dave and I were just saying we hadn’t been there in ages and I too LOVE that salsa with chips. This sounds like my kind of salsa, thanks Amanda! I’ve canned tomato’s for years. Stewed, juices and salsa. But I love the looks of the consistency of yours! I’ll try this this week and share with my Sis and we’ll let you know what we think. Hey! Can I use this salsa for pizza as well? By making the sauce a bit finer? LOVE IT! Some of my kids don’t like chunks, this has all of the great flavor without the chunk. THANKS FOR SHARING!! Hi Liz 🙂 I’m SO happy to hear that you all loved it! Delicious salsa, but next time, i will use way less cilanto and drain the water. we like ours bit thicker so it sticks on the chip. Otherwise, yummm! Thank you, I will definitely make again! I have made this several times! I use 1/2 a jalapeño and way less cilantro! It is just right for us! Thank you!! Hi Macy 🙂 I’m so glad you love the salsa and adjusted it to your tastes! lOVE YOUR SITE, SO CLEAN, NEAT,NO CLUTTER, VERY WELL LAID OUT. I just made this per your recipe and it is SPECTACULAR! I’m never buying the ‘fresh salsa’ from the store ever again. I can’t wait to make this for company. I tried with fresh tomatoes but its a little watery. The flavor is there but its not thick, any suggestions? Cut the tomatoes in half and squeeze out the juice and seeds. 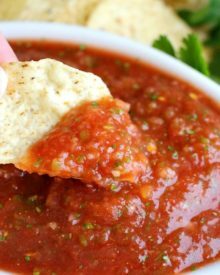 I’ve been making my own salsa for a while now and found that was the best way to get the consistency I wanted. Plus, tomatoes are pretty acidic and this helps lower the acidity. If using fresh tomatoes, how many? what kind of fresh tomatoes would you suggest? Roma? If using canned tomatoes, you say to use 28oz can. But for fresh, use 10-12 tomatoes? I can’t imagine there are 10-12 in a 28oz can. Am I missing something? 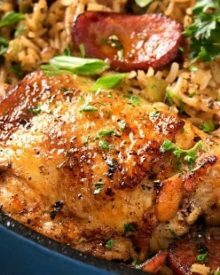 This recipe looks amazing so just want to get it right. I’m going to be using fresh tomatoes vs canned. Love this recipe! Huge hit for my family! Would like to make lots more as my garden is producing more tomatoes than we can eat. How long will this salsa stay good in the fridge? Hi Kim! 🙂 I’m so glad to hear that you love the salsa!! Ours usually doesn’t last too long (because we eat it lol), but I would think about a week or so? 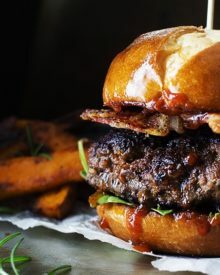 Has anyone tried canning this recipe?! I made this salsa for my husband tonight and it was amazing! Definitely going to be my “go to” salsa. We used our first salsa pepper from our first attempt at a garden. Thank you for sharing this recipe! Hi Bekah 🙂 I’m SO happy that you love the salsa!! Garden fresh is awesome! Looks delicious! Nothing better than fresh salsa! Salsa is always delicious. So nice you can make it in a hurry! This looks amazing! If using fresh tomatoes, do they need to be cooked or peeled first? Hi Cassie 🙂 Nope! You can just chop them and add them to the food processor 🙂 If you really don’t like the skin, feel free to score the bottoms of the tomatoes with a small “x” and blanch them, that way you can peel them. For me, the food processor chops them up finely enough, I don’t even notice that there are skins on the tomatoes. Hi Tara 🙂 I’m SO glad you love the salsa!! You sound like me… I can’t stay out of this salsa either lol. Hope you love the hummus as well! So good! I use this recipe every time we do taco night now! Thanks! Hi Katie 🙂 That’s so awesome, and I’m so glad you love the salsa! Hi Sherri 🙂 I’m so glad you love the salsa! Wow! I just made this and it is delicious! This is my new favorite salsa, and I’m a salsa connoisseur. I’ve tried a LOT of salsa recipes. This is so easy to make, and the flavor is incredible. I think the plum tomatoes make a big difference. Thanks for sharing! Hi Robert! 🙂 I’m SO happy you love this salsa as much as we do! During the warmer months, I swear I make a batch of this a week, at least 🙂 Thanks for stopping by to comment! Sounds like a quick and delicious way to enjoy salsa. Thank you for sharing! Do you think this would work with canned diced tomatoes? This salsa recipe is awesome. Making my 2nd batch right now. Thanx for the recipe! This is very much like my go-to salsa recipe except I haven’t added the jalapeno fearing the heat. Maybe I should just give it a try (minus those pesky hot seeds)! Love love love it! I accidentally made mine heat spicy. Is there anyway I can tone down the heat? I love this recipe. Thanks for the recipe! the red color of food attracts me always, because I am a fan of spicy food and yes I love chips as you asked who else does? 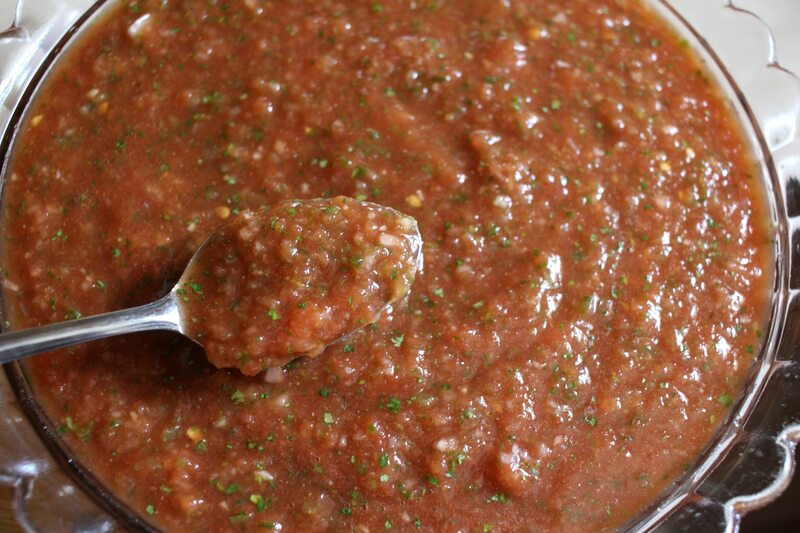 Try using garden fresh tomatoes rather than canned….then you’ll have the best salsa ever made. I grow everything for salsa except the limes. Nothing beats using fresh picked ingredients for salsa! This was super easy and really tasty especially on a potato. I’ve made other salsa recipes but the tomato flavour was to fresh for me. Makes a lot of salsa but doesn’t last long. Will definitely be making it again. Love a nice smooth salsa! 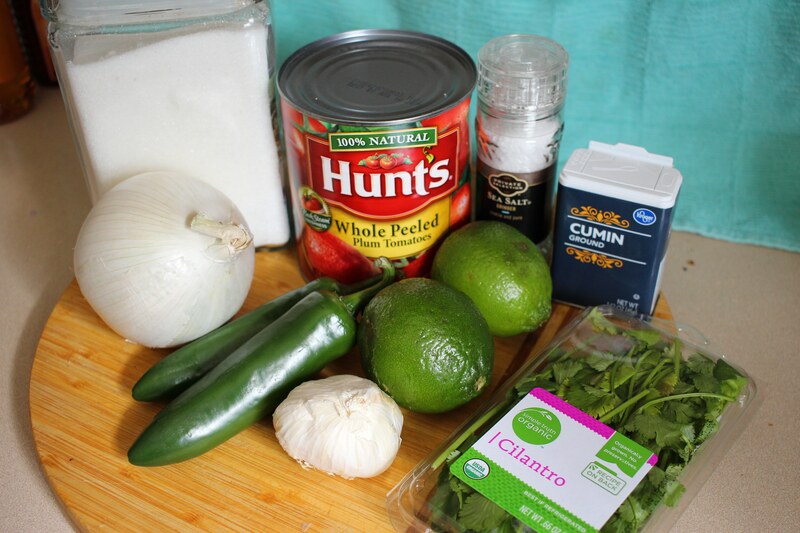 I love your quick and easy 5 minute salsa , just in time for our Father’s Day menu. Thanks so much for sharing your recipe. Pinned/shared. Thank you so much Joanne!! It’s so fresh, we love it 🙂 Hope you all love it too! This salsa is amazing! Really tasty and freash! I need some of this in my life! Looks delish! I have fallen in love with the look of your salsa. Will try soon. Happy FF! Thank you!! 😀 Happy FF to you too! This is something I’ve got to try! I’ve never made homemade salsa before, but you make it look so easy. Also, adding cumin sounds like a nice little kick. Thanks for sharing! This looks so fresh and delicious! Perfect for tailgating or just entertaining a couple friends. P-P-PINNED! This salsa is SPEAKING to me, I can not WAIT to try it… I’ve been wanting to try a new salsa recipe. I won’t bend much with my guacamole recipe, but salsa- yes! THANK YOU for sharing! !